Pressure washing may seem like something that is easily done to remove mold mildew and old debris from your deck, patios, siding and house. Many homeowners have found that there is quite a bit more involved than just renting a machine and blasting it off your property. Safety concerns are also an issue. Since the Environmental Protection Agency started banning the use of pressure treated wood due to chromated copper arsenate, most people have decided to seal their wood decks as the EPA suggests to prevent the arsenic from leaching into the soil. Most homeowners use local companies to pressure wash their decks and siding to save valuable time and the expense of rental equipment and some prefer to do the job themselves. If you decide to hire a contractor to perform the work for you, there are a lot of important questions you need to ask before you should allow them to work on your home. First, make sure the company you are hiring has the experience and the right equipment to perform the job properly, using more than 1,000 PSI or less than 4gpm can cause damage to wood. Make sure they are licensed and insured. 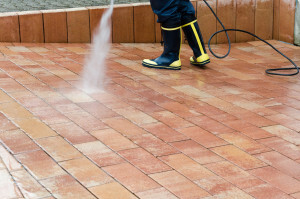 If you hire Helmke Industries to perform your commercial or residential power washing job, your property will look great and the job will be done safely and professionally. Make sure that any contractor you hire has a copy of this license and a long history of performing work in the area also; check them out with The Better Business Bureau. It will cost more time to find the right contractor for you but it could cost far more to hire a company without the proper experience or to do the job yourself. For example, most people don’t know that using household bleach to remove the mold and mildew from your deck will actually damage the woods lignin fibers. Or that too much pressure can also damage the woods surface and cause it to splinter or fur. Too many companies have decided they could tackle it without the proper training and with most machines putting out an average of 3,000 PSI it can be dangerous to the operator and your property. Properly learning the methods and training for cleaning wood requires training and a long-term investment, each deck or house is different and they all require special attention. Very similar to painting, deck sealers and preservatives won’t properly adhere to a wood surface that has an existing sealer on it. First this product must be removed from the deck using a stripping agent and you must take steps to ensure that the stripping agent will not harm the plants or siding on the home. 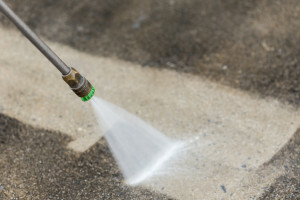 Most deck stripping agents have a sodium hydroxide base that will remove the existing sealer or stain and then it can be washed off with a pressure washer using a maximum of 1,000 PSI. When using a pressure washer you must clean with the grain of the wood the entire length of the board. By varying your distance from the wood or not going with the grain you may cause marks and discoloration in the surface. If done carefully, this will leave you with a clean surface for the next step. Pressure washing siding may seem safer to take on yourself but if you don’t have the proper tools and experience it could cost far more than you intended as well. Some of the most common mistakes made by homeowners and contractors are trying to remove the powdery coating called oxidation on aluminum siding. Removing this coating can cause discoloration and in some cases cause the siding to look like a completely different color. Using too much pressure can also force water up behind the siding where it will cause mildew behind the siding or in some cases, blow the siding off the house! Washing the house from the top down or letting chemicals dry on the house, which may leave streaks on the siding. Using a ladder to clean the upper areas of a house can result in serious injuries and death from slipping off the ladder. These are the types of mishaps that many people have when attempting to do a quick power washing of their home. You will be in good hands with Helmke Industries – a reputable and experienced power washing company.